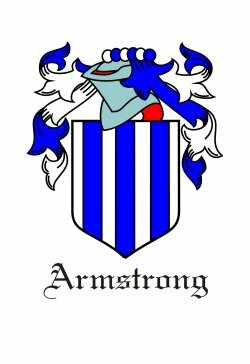 Name: The Armstrong family name was fairly evenly distributed across the United States in the 1990 Census at between 1:750 and 1:1000. British meaning "strong in the arm." History: Our Our Armstrongs were pioneers in the Scotch-Irish community of Augusta County, Virginia in the early 1700s. Margaret Armstrong may be the daughter of William Armstrong as evidenced by his will of 1790, and brother to Robert Armstrong as evidenced by a Augusta County Court entry stating that Nathaniel was Robert's brother-in-law. She married Nathaniel Lyon in 1760, and resettled in Knox County, Tennessee in the late 1790s. She and Nathaniel sold land in Beverly Manor to Joseph Cotton in Augusta County.